HOPING provides grants to grassroots community associations that are already working with young Palestinians in the refugee camps in Lebanon, Syria, Jordan, the West Bank and Gaza, as well as supporting a number of scholarship programmes. The activities we sponsor range from football tournaments and theatre workshops to scout groups and revision classes. The projects aim to improve all aspects of the children’s lives, giving them the opportunity to learn, to play, to build their lives creatively, and to express themselves through art, photography, film, music, theatre, dance and sport. If you are an organisation working in the Palestinian refugee camps in the region, and would like information on how to apply for a HOPING grant, visit our grants page or send us an email. Our HOPING events aim to raise money and awareness for Palestinian refugee children in an enjoyable and imaginative way. Since our first event in 2007, a star-studded list of artists including Elton John, David Gilmour and Roger Waters, Patti Smith, Red Hot Chili Peppers, Bryan Ferry, Jarvis Cocker, Gwyneth Paltrow, Chrissie Hynde, Boy George, Jeff Beck, Noel Gallagher, Van Morrison, Kate Moss, Nick Cave, Jools Holland, Primal Scream, Florence Welch, Gemma Arterton, and Tom Jones, have donated time and talent to bring the plight of Palestinian refugee children to the hearts and minds of our audience and the media. The musicians of Massive Attack have also worked closely with HOPING over the years, with a set of concerts. These events, along with our generous supporters, have raised more then three million pounds for young Palestinian refugees. The activities we support aim to improve all aspects of these children’s lives, giving them the opportunity to learn, to play, to build their lives creatively, and to express themselves through art, photography, film, music, theatre, dance and sport. 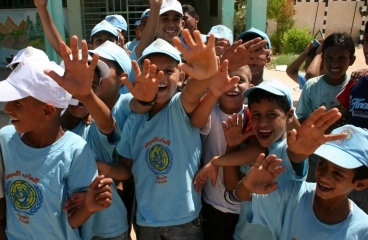 Hoping provides grants of $5000 and less to community projects working with Palestinian refugee children.